It seems a simple transition from reading the morning paper over a cup of coffee to flipping through the news on your iPad over a morning latte, but each of us likes to devour our news in a different way. We like different types of news. 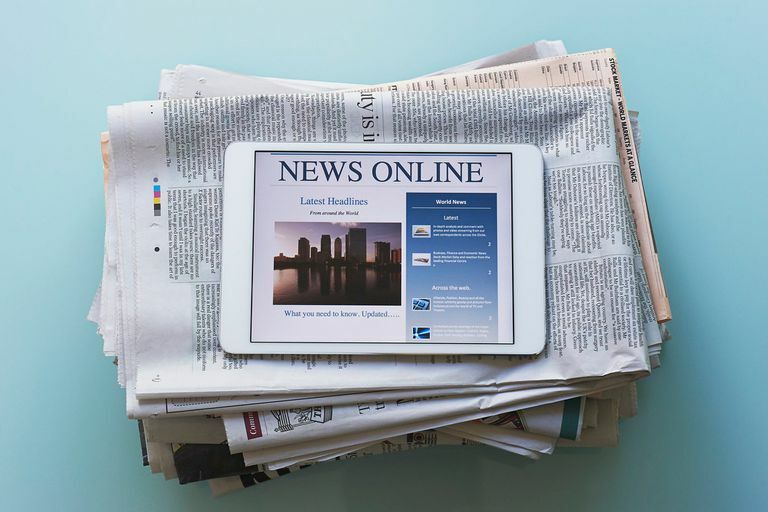 So whether you are looking to gobble down the news as quickly as possible or you want to get that old-fashioned reading-a-newspaper feeling, these apps have you covered. Morning, evening, and weekend digests. Sidebar for discovering new news sources or jumping to favorites. Syncs with News app on Mac computers. Huge collection of news sources is overwhelming. When Apple announced it were creating a News app, it entered an area where many have tried and failed. Believe it or not, many of the best known news apps have gone under. The Daily was a well-publicized attempt at digital news from News Corp. that lasted less than two years. Others, like Yahoo's Livestand and AOL's Editions have also come and gone. With News, Apple hit a home run. News isn't a digital paper with original stories. Instead, it is curated news from around the web presented in a fast, efficient format. News is also embedded in the operating system, so you see snippets on the expanded Spotlight Search page. You can also configure News with your preferences, so if you love sports, you can load it up with news from the NFL, NBA, MLB, and others. Articles can be saved to read later. Ads disguised as real stories. Apple News is great if you want to quickly scroll through articles and hand pick what you want to read, but what if you want that flip-through-the-paper feeling on your iPad? Flipboard started as a melding of your personal social media and articles derived from your social network feeds, but it has evolved into one of the best-curated news apps available on the iPad. The personal touch may be gone, but no app feels as much like flipping through a newspaper or magazine as Flipboard. Similar to Apple News, you can pick out the topics that most interest you to create your own personalized newspaper. Flipboard also offers its own curated "Daily Edition." It also has its own editions of major papers like the New York Times and the Washington Post. Contains all the elements of a print newspaper, plus some. Continually updates throughout the day. Ad-free experience requires monthly fee. Curated apps are great for getting the news, but what about the entire newspaper experience? Where's the stock prices? The sports scores? And, most importantly, the crossword puzzle? Few newspapers have done as good a job transforming themselves for the digital age as USA Today. The app is both streamlined and functional, allowing you to get a quick look at national news and your local weather. You also get a daily crossword puzzle and a daily sudoku. This makes USA Today a great substitute for the newspaper's place during your morning coffee. Great for people who prefer their GIFs animated and their news trending. Lots of celebrity and social content. Not for anyone looking for serious news. BuzzFeed has made a living out of going viral. It may not be the recommended site to find out the latest in world news or politics, but it's the perfect place to get to the truth behind that Ryan Gosling "Hey Girl" meme. You can also get the curated BuzzFeed News app, but where's the fun in that? Sleek app is easy to navigate. Access to live CNN broadcast in some areas. Intrusive ads appear before every linked video story. Top News view is just a list of boring headlines. You know an app is good when it is completely superior to the website. The CNN app stands above the rest not by packing a bunch of news into the app, but by making access to that news simple. There aren't a lot of bells and whistles to the app, but it is not plain either. It's simple to scroll through articles to find something of interest, and the main feature of the app's interface is the menu button in the upper-left corner that lets you choose different sections. Best of all, the app is lightning fast. Vast amount of sports information, video highlights and podcasts. Users' favorite teams are prominently displayed. Some free live TV coverage. Watching most live TV requires a monthly fee. Annoying full-screen ads you can't exit from. One thing that puts the ESPN app over the top as a sports news app is how much it packs into the app. When you open up theScore, you see a lot of unused real estate when you are not reading a story. ESPN puts that same screen space to use with a Twitter feed curating tweets about your favorite teams. In most ways, the apps are similar. You can pick favorite sports and favorite teams to follow, and they are both great at giving you a quick look at the day's sporting news.